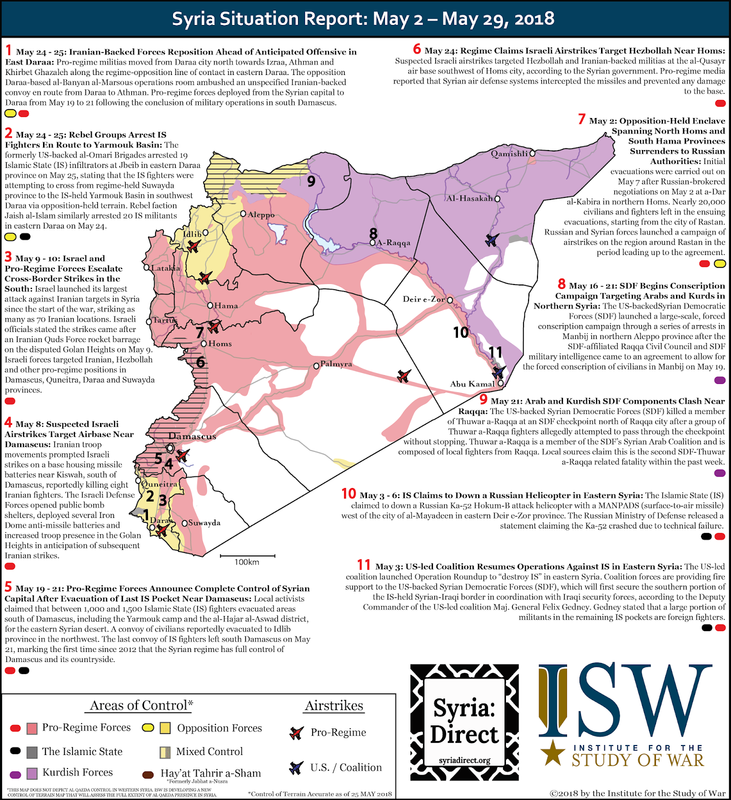 This graphic mark the latest installment of the Syria Situation Report (SITREP) Map made possible through a partnership between the Institute for the Study of War and Syria Direct. The map depicts significant developments in the war in Syria during the period June 12-28, 2018. The control of terrain represented on the map is accurate as of June 28, 2018. Key Takeaway: Iran and Russia are preparing to attack the U.S. and its primary ground partner - the Syrian Democratic Forces (SDF) - in Eastern Syria. These threats may coerce the SDF to abandon its relationship with the U.S. and instead cut a deal with Assad. Iran and Russia will attempt to compel the withdrawal of the U.S. from Syria by inflicting deniable costs and stoking guerilla conflicts through their proxies in Northern and Eastern Syria. The U.S. must commit to defending its partners and presence in Eastern Syria in order to prevent the resurgence of ISIS and deny key resources to Iran, Russia, and Assad. Iran, Russia, and Syrian President Bashar al-Assad are preparing to attack the U.S. and its primary ground partner - the Syrian Democratic Forces (SDF) - in Eastern Syria. Iran, Russia, and Assad seek to compel a withdrawal of the U.S. from Syria by imposing costs (including casualties) on the U.S. Anti-ISIS Coalition. Assad reiterated his intent to recapture terrain held by the SDF in Northern Syria in separate interviews with Kremlin-controlled media on May 31 and June 24. Assad stressed that the regime will not hesitate to use force if negotiations fail with the SDF. Liwa al-Baqir – a Syrian Arab tribal militia backed by Iran and Russia. Liwa al-Baqir - a tribal militia trained by the Iranian Islamic Revolutionary Guards Corps (IRGC) - published a statement calling for jihad against the U.S. in Syria on April 6. Iran and Russia are likely helping to build the capabilities of Liwa al-Baqir in Eastern Syria. Iran coopted a prominent sheikh of the Baggara Tribe to recruit pro-regime tribal forces from Lebanon and Syria in 2017. The Baggara Tribal Confederation operates primarily in SDF-held areas in Deir ez-Zour Province. These new recruits are likely joining Liwa al-Baqir, which consolidated military positions near SDF-held oil and gas fields near Deir ez Zour City from March to April 2018. Russia also provides military and logistical support to up to 8,000 pro-regime tribal fighters, likely augmenting Liwa al-Baqir. Iran and its proxies in Eastern Syria. The IRGC and Iranian-backed proxies including Lebanese Hezbollah and elements of the Iraqi Popular Mobilization Forces (PMF) are present in regime-held areas of Deir ez-Zour Province. An alleged airstrike by Israel targeted a buildup of PMF and Hezbollah in Eastern Syria on June 18. The airstrike also likely killed an IRGC Brigadier General, whom Iran confirmed died near Abu Kamal in Southern Deir ez-Zour Province. Iran is disguising some of its forces and proxies as regime units in order to obfuscate the extent of its military presence in Eastern Syria. “Cross-border militias” - likely a reference to Iranian proxies - are reportedly wearing the uniforms of the Syrian Arab Army in Deir ez-Zour Province. Iran leverages this technique elsewhere in the region, including Iraq and the Golan Heights. Pro-regime tribal forces backed by Iran. Assad and Liwa al-Baqir convened a major meeting of tribal notables from across Syria on June 2 in order to build support for operations against the U.S. in Eastern Syria. Syrian state media claimed the meeting included representatives from seventy clans from Aleppo, Ar-Raqqa, Hasakah, Deraa, and Deir ez-Zour Provinces. Unconfirmed reports suggest that the SDF arrested dozens of additional tribal representatives travelling to the meeting from SDF-held Hasaka Province in Northern Syria. Tribal representatives at the meeting denounced the presence of the U.S., France, and Turkey in Syria and called for tribal mobilization to fight them on behalf of Assad. Multiple new pro-regime militia units of unclear size and capability reportedly formed subsequent to the meeting. These units may have joined Liwa al-Baqir with support from Russia and Iran. Russian combat engineers and private military contractors. Russian combat engineers deployed to Syria in April 2018. Kremlin-controlled private military contractors (PMC) are similarly deployed in Eastern Syria and will likely participate in future attacks against the U.S. Anti-ISIS Coalition. The Kremlin used a PMC-led force to attack the SDF and U.S. near Deir ez-Zour City in February 2018. Russia may use these assets to directly support an attack against the SDF or indirectly enable such an attack by helping secure rear areas for Assad. Russia may have prepositioned additional assets in Eastern Syria under the guise of operations against ISIS. Other pro-regime militias backed by Russia. Russia supports other Syrian tribal militias that operate in Eastern Syria, including a group called the Forces of the Fighters of the Tribes. Russia also trains the Syrian ISIS Hunters militia which often fights alongside Russian PMCs. The ISIS Hunters – despite their name - have attacked both opposition groups and the U.S. in Syria. The ISIS Hunters deployed additional forces to Southern Deir ez-Zour Province from Damascus in early June 2018, ostensibly to intensify operations against ISIS. Russia could use these forces and deployments to attack the SDF and U.S. in Eastern Syria. Russia and Iran have increased their propaganda efforts against the U.S. in Syria, highlighting their resolve to escalate against the U.S. Anti-ISIS Coalition. Kremlin-backed Sputnik News quoted a senior advisor to Iran’s Supreme Leader stating that terrain held by the SDF in Syria will become “another Vietnam for the U.S.” on June 22. The Russian Ministry of Defense claimed on June 10 that U.S.-backed opposition groups were preparing a chemical weapons attack against pro-regime units stationed in oil fields southeast of Deir ez-Zour City. Russia also repeatedly claimed that U.S.-backed forces have both directly attacked the regime and supported attacks against pro-regime forces by ISIS in Central and Eastern Syria from June 11 - 18. Two Iranian-backed Iraqi Shi’a militias announced their intent to retaliate against the U.S. for the airstrike against their forces in Eastern Syria on June 18. Russia and Iran are framing the U.S. and its partners as aggressors in order to justify and legitimize future attacks against the U.S. in Eastern Syria. The rising volume of this rhetoric may indicate that Iran and Russia intend to escalate in the near-term rather than wait for the conclusion of operations against ISIS. 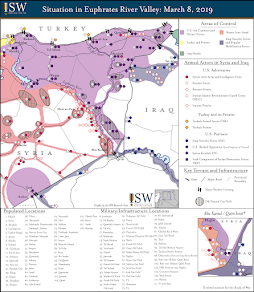 Russia, Iran, and Assad have not been deterred from further escalation by the overwhelming defeat of a large-scale attack by their proxies against the U.S. and SDF in February 2018. Iran and Russia have instead enabled Assad to conduct additional probing attacks to demonstrate resolve and test the capabilities of their new forces against the SDF. Russian military engineers erected one or more bridges to enable a cross-river attack against the SDF along the Euphrates River on April 29, 2018. The attack involved Liwa al- Baqir, Syrian National Defense Forces (NDF), and unidentified reinforcements from Deir ez-Zour City. These reinforcements may have included Russian PMCs. The SDF later recaptured the villages after air support from the U.S. reportedly destroyed at least one of the bridges erected by Russia. The SDF continues to exchange artillery and small-arms fire with pro-regime forces in the region. Iran, Russia, and Assad could conduct a guerilla campaign to destabilize SDF-held areas and target the U.S. in Syria. Russia, Iran, and Assad can use their small presence in Northern Syria near reported bases used by the U.S. Anti-ISIS Coalition to disrupt and threaten the U.S. and SDF. Russia and Iran could also leverage their tribal proxy networks in order to support an increased campaign of guerilla attacks against the U.S. in Northern Syria. Pro-regime forces began infiltrating regions held by the SDF as early as February 2018 when a new pro-regime group called the Popular Resistance in the Eastern Region formed and announced its support for the jihad against the U.S. in Syria. The group carries out subversive activities to spread anti-American sentiment within Ar-Raqqa City and also claimed attacks against positions held by the U.S. and France in Northern Syria on April 12. Pro-regime elements likely also placed two IEDs that targeted a U.S.-French joint military base north of Ar-Raqqa City on June 4 and an SDF patrol inside Ar-Raqqa City on June 17. Another new pro-regime group called the Popular Resistance in Manbij also declared an uprising against the U.S. and SDF in the contested town of Manbij in Northern Aleppo Province on June 25. The new group suggests growing momentum behind recruitment efforts led by Liwa al-Baqir in Aleppo Province. Pro-regime elements may have placed an IED that killed two coalition service-members from the U.S. and near Manbij on March 29, 2018. Russia, Iran, and Assad intend to compel the SDF to abandon its partnership with the U.S. The relationship between the U.S. and SDF is increasingly fragile following due to Turkey’s invasion of majority-Kurdish Afrin Canton in Northern Syria in January 2018. The relationship has also been strained by new cooperation between the U.S. and Turkey over the contested SDF-held town of Manbij in Northern Aleppo Province. The SDF agreed to unconditional negotiations with Assad on June 10, signaling an increased willingness to grant concessions in return for future protection against Turkey. The military pressure generated by Russia, Iran, and Assad in Eastern Syria may further accelerate a deal between Assad and the SDF that could force a withdrawal of the U.S. Anti-ISIS Coalition from Syria. Russia and Iran may seize the initiative in Eastern Syria while the U.S. attention is focused on Turkey and Southern Syria. The U.S. Anti-ISIS Coalition remains focused on the implementation of the new framework agreement with Turkey in Manbij as well as continued counter-ISIS operations near the Syrian-Iraqi Border in Eastern Syria. The U.S. is also focused on Southern Syria, where Russia and Iran are supporting a regime offensive against opposition-held areas that violates a de-escalation zone brokered by the U.S., Russia, and Jordan in 2017. Russia, Iran, and Assad may exploit this divided attention to seize the initiative in Eastern Syria. The U.S. must commit to retaining its partnerships and presence in Eastern Syria. The U.S. Anti-ISIS Coalition’s gains in Syria will unravel if the U.S. fails to deter or block the continued subversion campaign by Russia, Iran, and Assad. The recent breakthroughs with Turkey over Manbij is an important step but could backfire if it leads to a wider fracture between the U.S. and SDF. The U.S. must not allow the SDF to cut a deal with Assad. Instead, the U.S. should commit to providing enduring military support to the SDF in order to deny access to critical terrain and natural resources to Russia, Iran, and Assad. Key Takeaway: Turkish President Recep Tayyip Erdogan has emerged from snap elections poised to dominate the next decade of politics in Turkey. Erdogan is empowered to further consolidate his domestic power and degrade the rule of law at the expense of his political opponents. The U.S. will face a more nationalistic – and more intransigent - Turkey that is more willing to buck its alliance with NATO and expand military operations against Kurdish militants in Syria and Iraq. Turkish President Recep Tayyip Erdogan achieved his longstanding goal to consolidate his political dominance over Turkey’s failing democracy. Erdogan secured the presidency and a majority parliamentary coalition following snap elections held in Turkey on June 24. Erdogan will preside over an executive presidency with new wide-ranging powers codified after he won a referendum to amend the Turkish Constitution in April 2017. He can now issue presidential decrees with the force of law – a power previously available only during a state of emergency. Erdogan will use his new mandate to erode the few remaining independent arms of the Government of Turkey, starting with the Turkish Central Bank. Allegations of electoral fraud and manipulations abound. The opposition has nevertheless conceded the elections. The Organization for Security and Co-operation in Europe (OSCE) stated that authorities restricted “fundamental freedoms” and held an “undue advantage” in the election. The Turkish Supreme Elections Committee will announce the finalized results on July 5. See the note below regarding the validity of the figures in this infographic. Erdogan is now more dependent on his alliance with the main right-wing party and will likely confront Kurdish militants more forcefully. Erdogan's ruling Justice and Development Party (AKP) lost its majority in the Turkish Parliament. He nonetheless retained a parliamentary majority through his alliance with the right-wing Nationalist Movement Party (MHP). Erdogan must remain responsive to the MHP even though the new executive presidency sharply curbs the power of the legislature. The MHP takes an uncompromising stance in favor of a militarized approach to the Kurdistan Workers’ Party (PKK) and its affiliate in Syria. Erdogan will likely satisfy this domestic audience by making good on his promises of expanded operations against the PKK in Iraq and Syria. Erdogan’s campaign against PKK-affiliates partnered with the U.S. in Syria will serve to deepen the rift in the U.S.-Turkish alliance. 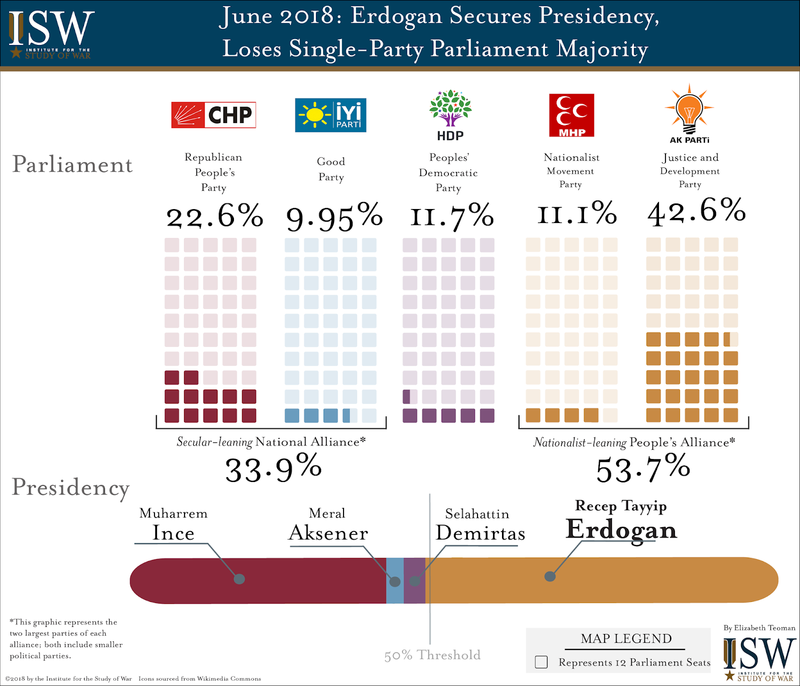 Infographic Note: This graphic presents interim election results sourced from Turkish state-run Anadolu Agency endorsed by the Supreme Electoral Council of Turkey. These results reflect a Turkish election that was neither fair nor free with electoral fraud likely. Key Takeaway: The U.S. and Afghanistan have an opportunity to advance their strategic goal of negotiating an acceptable settlement with the Taliban, but not all Taliban members are reconcilable. The Taliban faces a potential rift between its leadership and rank-and-file militants in Afghanistan that threatens the Taliban’s cohesion. Large numbers of rank-and-file militants expressed their support for peace during unprecedented joint celebrations alongside Afghan National Security Forces (ANSF) during a nationwide ceasefire for Eid al-Fitr on June 15 - 17. The ceasefire’s events exposed rifts amongst Taliban leadership concerning reconciliation. The U.S. and the Government of Afghanistan could exploit these apparent rifts in order to advance their strategic goal of a negotiated settlement with the Taliban. The new momentum towards peace could nonetheless generate additional pressure for the withdrawal of the U.S. from Afghanistan amidst the scheduled 2018 Afghan Parliamentary Elections. ISIS - Wilayat Khorasan could also exploit these rifts in to bolster its recruitment of hardline Taliban militants and expand its operations in Afghanistan. The Taliban and Afghan National Security Forces (ANSF) engaged in “remarkable scenes” of joint celebration during a three-day ceasefire observed by both the Taliban and the ANSF. The Government of Afghanistan estimated that up to 30,000 Taliban militants entered government-held cities across the country during the three-day truce in honor of the end of Ramadan. The gatherings reportedly occurred in several regions that have seen intense fighting during the Taliban’s 2018 Al-Khandaq Offensive including Faryab, Farah, Ghazni, and Kunduz Provinces as well as traditional Taliban strongholds such as Helmand and Kandahar Provinces. Even “senior” leaders reportedly met with government officials in Zabul and Logar Provinces. Taliban fighters interviewed by the media repeatedly expressed their fatigue with continued violence and their growing desire for peace. The ceasefire could validate President Ghani’s strategy to achieve a negotiated settlement. Ghani offered the Taliban full political reconciliation in exchange for a ceasefire and the resumption of peace negotiations on February 28. The Taliban refused to acknowledge the offer officially, although multiple U.S. officials have claimed that elements of the Taliban including “senior-level leaders” are “clearly interested” in talks with the Government of Afghanistan since Ghani’s peace offer. Ghani later unilaterally announced the ceasefire for Eid al-Fitr on June 7 despite ongoing operations by the Taliban that threatened at least seven provincial capitals around Afghanistan. The Taliban bowed to public pressure and announced their own nominally-unrelated ceasefire on June 9. Ghani has attempted to leverage the apparent success of the truce to spur further political progress. Ghani announced a unilateral ten-day extension of the ceasefire - until June 30 – on June 17. He also stressed that his government is open to negotiations with the Taliban on “issues of mutual concern” including the “presence of foreign forces” in Afghanistan. The Taliban leadership has thus far rejected further extension of a ceasefire and has resumed its attacks in some remote locations. The Taliban spokesperson stated that the group has “no intention to extend the ceasefire" on June 17 and resumed offensive operations throughout Afghanistan including on June 18. Taliban militants conducted significant attacks in Faryab, Badghis, and Farah Provinces since their ceasefire’s expiration. The Taliban may intend to exploit the government’s extended ceasefire to amass fighters and launch a coordinated operation against vulnerable provincial capitals in Faryab or Farah Provinces. The Taliban also executed smaller attacks in many provinces where joint celebrations occurred such as Kunduz, Logar, Nangarhar, and Helmand. The Taliban faces a potential rift between its leadership and rank-and-file militants in Afghanistan that threatens the Taliban’s cohesiveness. Taliban militants repeatedly violated a formal directive from their leadership to avoid government-controlled areas on June 16. Taliban fighters also demanded an extension to the ceasefire in parts of Paktika Province controlled by the hardline Haqqani Network. The Taliban released an official post-ceasefire statement stressing the organizational cohesion and control demonstrated by the “successful implementation” of the truce despite the clear violations of leadership orders. The Taliban leadership also allegedly considered a ten-day ceasefire for late 2018 due to growing pressure for a negotiated settlement within the Taliban. The Government of Afghanistan and the U.S. could attempt to exploit the apparent divisions within the Taliban to split rank-and-file fighters from their leadership if the Taliban refuses to engage with Kabul. The Taliban also faces a power struggle within its ruling Quetta Shura. The ceasefire could exacerbate a rift between Taliban leaders who are open to reconciliation and hardliners unwilling to negotiate a settlement. The joint celebrations reportedly surprised and angered some Taliban leaders including Taliban Second Deputy Leader Mullah Yaqoob. Taliban leader Mullah Haibatullah Akhundzada – a reported moderate - may use widespread support for peace amongst the rank-and-file to consolidate his control within the Quetta Shura vis-à-vis hardliners such as Mullah Yaqoob and First Deputy Leader Siraj Haqqani. This power struggle predates the ceasefire. Akhundzada reportedly reshuffled multiple shadow governors and senior leaders to increase his control over the movement in February 2018. Rumors of additional post-ceasefire leadership changes may further demonstrate shifting dynamics in favor of Akhundzada. The weakening of hardliners like Haqqani - who maintains close ties to al Qaeda and Pakistan - in favor of Akhundzada could open space for peace-inclined factions of the Taliban to pursue a negotiated settlement. Hardline elements are likely to continue the fight against Kabul. The U.S. could exploit these apparent rifts in order to advance its strategic objectives in Afghanistan. The U.S. intends to use military and diplomatic means to pressure the Taliban to negotiate a peace settlement with the Government of Afghanistan. U.S. Secretary of State Mike Pompeo stated that the U.S. is “prepared to support, facilitate, and participate” in peace negotiations that would include “a discussion of the role of international actors and forces” in Afghanistan on June 16. U.S. Deputy Assistant Secretary of State for South and Central Asian Affairs Alice Wells reaffirmed the willingness to participate in negotiations but reiterated the established U.S. position that the Taliban must negotiate directly with the Government of Afghanistan on June 20. Incoming U.S. Forces – Afghanistan Commander Lt. Gen. Scott Miller has also testified that a political settlement must end the War in Afghanistan. The U.S. nonetheless must remain cautious that the peace process does not jeopardize its access to Afghanistan. Members of the both houses of the Afghan Parliament have criticized the U.S. role in Afghanistan since May 2018. Some members of the upper house have called for the review or cancellation of the Bilateral Security Agreement (BSA) between the U.S. and Afghanistan. Meanwhile, peace protesters marching from Helmand Province to Kabul to encourage reconciliation with the Taliban have also demanded a specific timeline for the withdrawal of the U.S. from Afghanistan. Taliban sources have also claimed that a clearly-defined timeline for withdrawal could have persuaded Taliban leadership to accept a ceasefire extension after Eid al-Fitr. These converging demands for the withdrawal of the U.S. from Afghanistan could begin to spiral into a widespread populist movement ahead of the scheduled 2018 Afghan Parliamentary Elections and 2019 Afghan Presidential Elections. The U.S. must not depart abruptly or under a fixed timeline but rather through a gradual drawdown after setting and testing the conditions for sustained peace in Afghanistan. ISIS could also exploit the ceasefire and possibility of a negotiated settlement to expand its operations in Afghanistan. ISIS’s Afghanistan branch, ISIS Wilayat Khorasan, claimed two separate attacks that targeted joint celebrations between the Taliban and ANSF in Nangarhar Province during Eid al-Fitr. The statements noted that the attacks targeted gatherings of both the ANSF and “the apostate Taliban Movement.” The Taliban later released a post-ceasefire statement arguing that the Taliban is the only movement leading “jihad across the country,” and adding that “multiple parties [are] not participating in this jihad.” The statement - while directed against the U.S. assessment of a fractured jihadist movement in Afghanistan - may also highlight the Taliban leadership’s concern that the ceasefire will harm their credentials as the leaders of the jihad in Afghanistan. ISIS could position itself to recruit dissatisfied hardline members of the Taliban if Taliban leadership begin openly pursuing a peaceful settlement with the Government of Afghanistan. The Government of Afghanistan initially announced a unilateral eight-day ceasefire from June 12 - 20 before extending it to June 30. The Taliban’s “unrelated” ceasefire only lasted from June 15 - 17. Mullah Yaqoob is the son of the Taliban’s founder – Mullah Omar. Key Takeaway: The Kremlin has successfully expanded its influence in Egypt – a historic partner of the U.S. and the West. Russia has secured approval to establish an industrial zone in Port Said; concluded major energy deals, including the construction of Egypt’s first nuclear power plant; increased weapons sales; and obtained Egypt’s diplomatic backing on a number of regional initiatives. The Kremlin is likely attempting to secure a naval base in Egypt in order to expand its presence in the Eastern Mediterranean Sea and contest U.S. freedom of maneuver through the Suez Canal. Russia cannot compete in the long-term with the U.S., which provides nearly $1.3 billion in annual military aid to Egypt. The Kremlin will therefore focus on offering to support Egyptian President Abdel Fattah al-Sisi in areas of core concern for his constituencies, such as security, food, and energy. 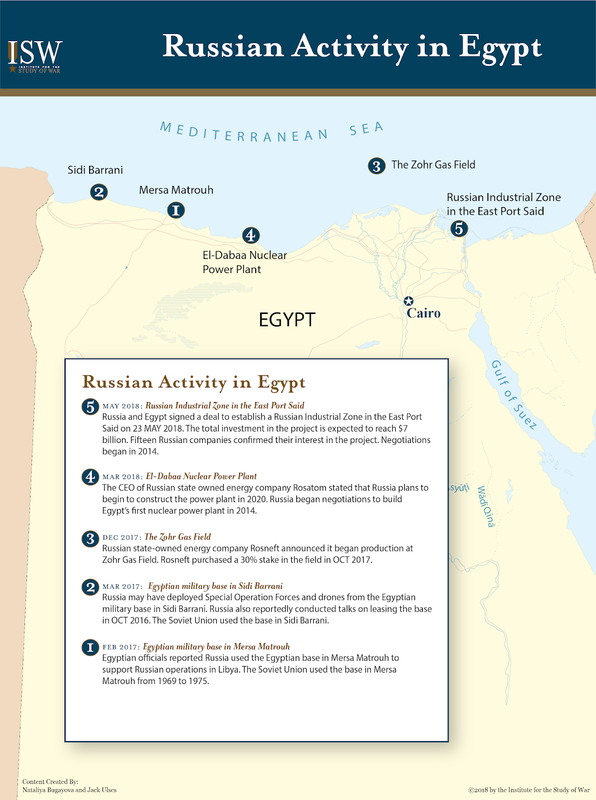 Russian activity in Egypt is part of the Kremlin’s regional campaign to expand its influence in the Middle East and Africa. The U.S. must use its leverage with Egypt not only to sustain its partnership with a key regional actor and guarantee its freedom of maneuver in the Mediterranean Sea and the Suez Canal, but also to curb Sisi’s continued use of oppressive measures against his own population. Read the full version of this article on the ISW website. Key Takeaway: The Kremlin is conducting hybrid operations to secure a combined land and sea arc spanning from the occupied Crimean Peninsula through the Sea of Azov to Eastern Ukraine. Russia’s Caspian Sea Flotilla deployed naval vessels to the Sea of Azov in late May 2018. The ships ostensibly will defend a new bridge connecting Russia to Crimea. The Kremlin also used signature irregular warfare methods including information operations and snap military exercises to sow confusion and instability in port cities held by Ukraine along the Sea of Azov. 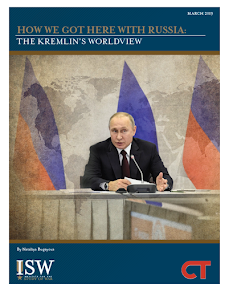 The Kremlin holds a long-standing interest in obtaining de facto control over the region in order to secure economic resources and block Ukraine’s access to maritime industries. Russia may also intend to use these operations as a venue to destabilize Ukraine ahead of the scheduled 2019 Ukrainian Presidential and Parliamentary Elections. 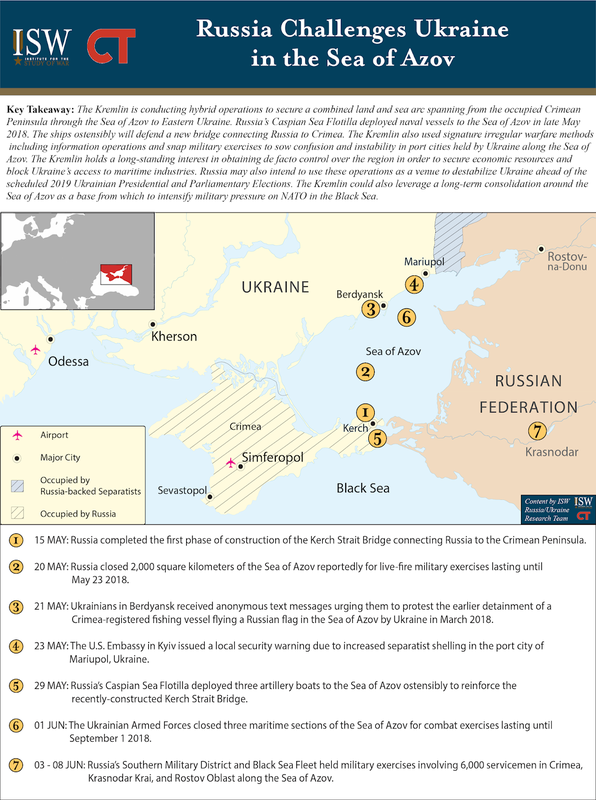 The Kremlin could also leverage a long-term consolidation around the Sea of Azov as a base from which to intensify military pressure on NATO in the Black Sea. Key Takeaway: Key Iraqi Shi’a and Kurdish leaders have signaled their support for a new Iran-backed political alliance, setting up a potential coalition with enough parliamentary seats to form the next Iraqi government. Such a governing coalition would further strengthen Iran’s position in Iraq and undermine the U.S. ability to secure its own interests in Iraq. Iraqi nationalist Shi’a cleric Moqtada al-Sadr and Iranian proxy and Badr Organization head Hadi al-Ameri formed an alliance on June 12, 2018. 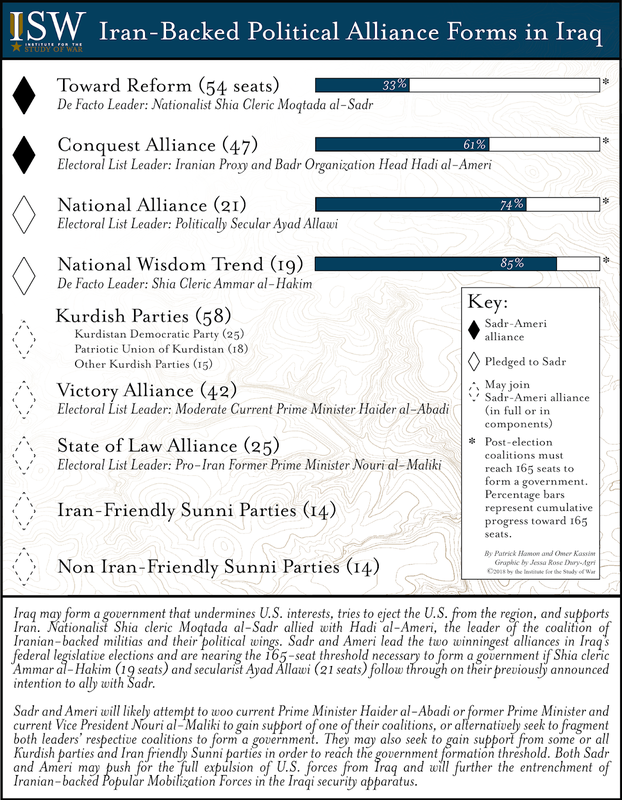 Their respective electoral lists represent the two winningest alliances in Iraq’s federal legislative elections that occurred on May 12, 2018. Former Iraqi Prime Minister and current Vice President Nouri al-Maliki, Shi’a cleric Ammar al-Hakim, and two major Kurdish parties have signaled their support for the Sadr-Ameri alliance. A formal coalition emerging among these actors and the electoral lists they lead would clear the 165-seat majority threshold required to form a government. A Sadr-Ameri alliance under this scenario would not need support from blocs led by current Prime Minister Haider al-Abadi and secularist Ayad Allawi. This emerging coalition may encounter obstacles before it can proceed to form the next Iraqi government. Disagreements over the position of Prime Minister and key ministerial posts may drive the different factions within the coalition apart. There will likely be a partial manual recount of votes following allegations of widespread electoral fraud that may change the final election results. Key Takeaway: Iraq may form a government that undermines U.S. interests, tries to eject the U.S. from the region, and supports Iran. Nationalist Iraqi Shi’a cleric Moqtada al-Sadr has allied with Hadi al-Ameri, the leader of the coalition of Iranian-backed militias and their political wings. 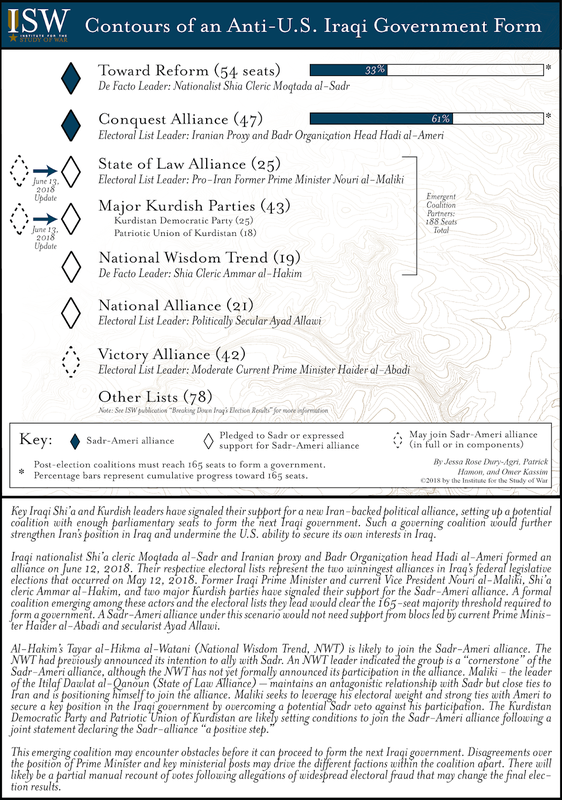 Sadr and Ameri lead the two winningest alliances in Iraq’s federal legislative elections and are nearing the 165-seat threshold necessary to form a government if Shi’a cleric Ammar al-Hakim (19 seats) and secularist Ayad Allawi (21 seats) follow through on their previously announced intention to ally with Sadr. Sadr and Ameri will likely attempt to woo current Prime Minister Haider al-Abadi or former Prime Minister and current Vice President Nouri al-Maliki to gain support of one of their coalitions, or alternatively seek to fragment both leaders’ respective coalitions to form a government. They may also seek to gain support from some or all Kurdish parties and Iran friendly Sunni parties in order to reach the government formation threshold. Both Sadr and Ameri may push for the full expulsion of U.S. forces from Iraq and will further the entrenchment of Iranian-backed Popular Mobilization Forces in the Iraqi security apparatus. For the full Iraq Council of Representatives seat allocation figures, see ISW's election results graphic. 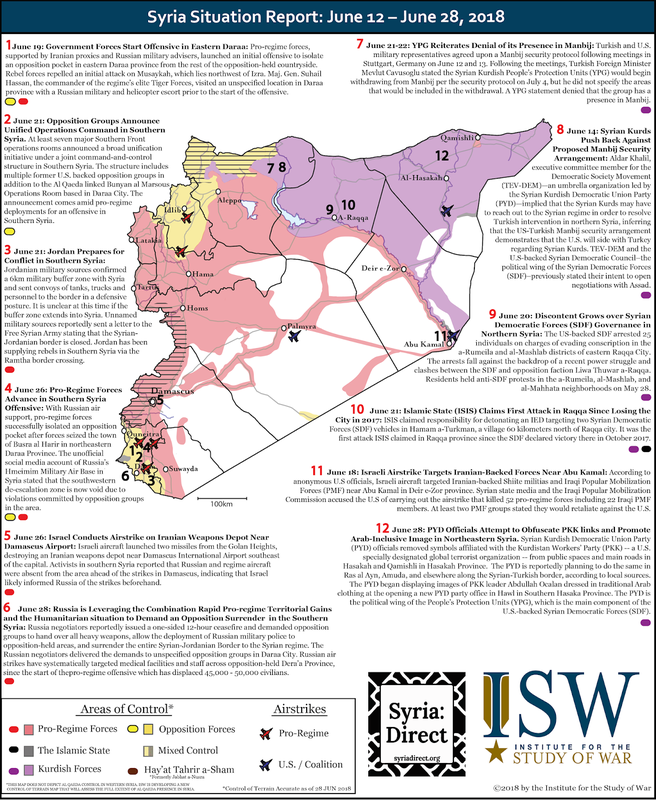 This graphic mark the latest installment of the Syria Situation Report (SITREP) Map made possible through a partnership between the Institute for the Study of War and Syria Direct. The map depicts significant developments in the war in Syria during the period May 2-29, 2018. The control of terrain represented on the map is accurate as of May 25, 2018.